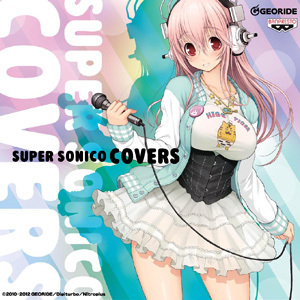 Nitroplus spokesgirl and mascot Super Sonico surprised the hell out of me when she covered Nirvana’s “Smells Like Teen Spirit” for last year’s Top 50 Oricon release “Love & Peace II Plus”. It looks like the bug has bitten her again, because she’s returned with a 4-track CD Covers, which at this point is only available as a lottery item from Japanese company Banpresto. Produced by Swinging Popsicle’s Hironobu Hirata, the choices here may seem a little out of left field, but it’s a great strategy by Nitroplus and Banpresto to put Sonico in the the musical hands of such respected songwriters. In the era of manufactured idols dominated by Hatsune Miku, it might be easy to write off the whole genre as a gimmick, but Sonico has a real band behind her, and a real voice before it gets filtered through production magic that brings us into Sonico’s digital world. I’m beginning to think that the ultra-manufactured image might let us appreciate the music even more. Lindberg’s “Believe in Love” from 1991 might pre-date many of Sonico’s younger fans, and the sugar-sweet vocals from Sonico can’t match the power of Lindberg’s Maki Watase. But the song’s meaning finds new life coming from Sonico, and it becomes more innocent in this new version. The Blue Hearts “Yume” goes even further out a limb, transforming the 1992 punk release into video-game disco. Credit to Hirata for making this version familiar and bizarre at the same time, and for not pushing Sonico to match the harshness of the Blue Hearts original. Princess Princess’s “M” is where Sonico hits the mark of the original ballad’s tempo and feeling. The covers plays it safe by sticking close to the source material, and it’s a good choice to slow down the EP. Rounding out the EP is IDOLM@STER song “Catch me☆Get you! – Banpresto no Uta” and it’s Sonico’s best vocal performance on the release. You can’t buy this CD (yet) but doubtless these songs will show up on a future compilation. Overall, it’s a cool selection and a solid pick for anyone who’s new to the electric idol genre.